Sheaffer IMPERIAL 827 Ballpoint pen from the Imperial line. Fine smooth silver-colored finish (probably palladium) with gold trip and with a Reminder clip and a white dot. Excellent condition with very little wear and few marks. The pen is still working very well. It is a lovely, sleek pen. Type Ballpoint pen, working well. Product Name Imperial series or possibly the later Triumph Imperial series. It looks like an Imperial with the short clip, but it doesn't match any Imperial that we know of and so we think it might be from the 1990s Triumph Imperial line which had model 2870 which was palladium lated with gold trim. Filling System The ballpoint pen takes standard Sheaffer refills, and a working refill is included. This pen is one of the "reminder clip" models, which are activated by pressing the clip in. Color The body is a silver-colored material which is probably palladium, with gold trim. Condition Excellent condition with no cracks or dents or marks. Light handwear. The pen is working well. 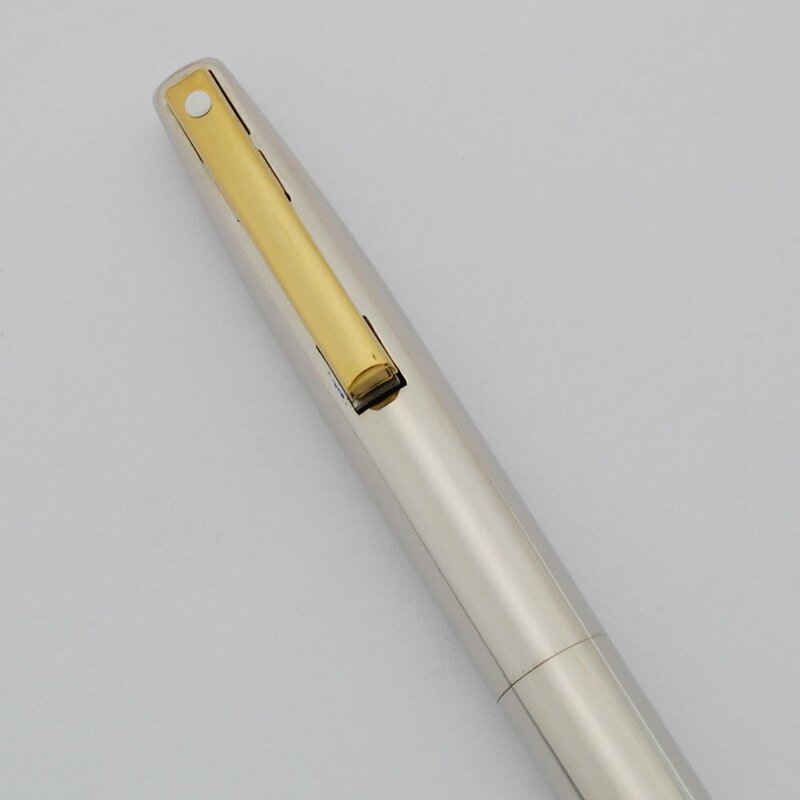 It is a lovely, elegant and sleek pen.